Seasonal affective disorder, or seasonal depression as it's sometimes referred to, is a mood disorder characterized by feelings of depression that coincide with one or more seasons of the year. This disorder typically occurs during the fall and winter months as the days grow shorter and temperatures drop, although a rarer version can occur during the summer for some. Known colloquially as the winter blues, SAD, hibernation reaction or winter depression, the condition can leave those suffering from it feeling like lesser versions of themselves. It's symptoms are virtually identical to standard depression and there are a few ways it can be treated, some without the need for anti-depression medication. Brain chemistry can be altered by the lack of sunlight during the winter and fall months, which can lead to depression. "Regular exposure to natural light can decrease melatonin levels." According to MedicineNet.com, seasonal affective disorder has only been an officially diagnosable disorder since around 1985. SAD is widely believed to be greatly affected by the lack of sunlight people experience in the winter. This develops into an increase of the sleep-causing chemical melatonin and a decrease in the happiness-inducing substance serotonin within the brain. It also creates a lack of vitamin D in the blood. The imbalance of these chemicals prevents the brain from properly regulating a person's mood and the affected individual will eventually experience depression-like symptoms. No interest in or contentment derived from fun activities. Weight gain due to overeating. Symptoms generally begin during the fall and alleviate in the spring. SAD affects between 1 and 10 percent of U.S. adults and its severity is largely dependent on a person's geographic location. The closer someone is to the equator, the lower their chances of experiencing SAD due to more exposure to regular sunlight. MedicineNet.com reported it affects women four times as often as men and that it typically develops beginning at the age of 23, however a person of any age can experience it. WebMD noted that SAD may be hereditary to a degree and individuals who have a family history of the disorder or general depression are at increased risk of experiencing it. SAD may also worsen symptoms of depression that a person may already be experiencing. Regular exposure to natural light can decrease melatonin levels and reverse some of the mood changes caused by SAD. For those living in areas where the sun only shines briefly during the day, taking a trip to a more sun-friendly location near the equator can be beneficial. 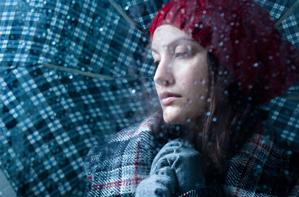 Other lifestyle changes can also assist in fighting seasonal depression. Exercising consistently can raise serotonin levels and ease stress. Maintaining good eating habits like consuming foods high in protein and nutrients can restore vitamin D levels and make a person feel more refreshed and less fatigued. WebMD also recommended that SAD sufferers remain socially engaged and make efforts to spend time with family and friends. A more advanced measure to fight seasonal depression comes in the form of light therapy. The treatment is intended to boost melatonin production by mimicking sunlight exposure, ultimately producing an effect similar to an anti-depressant. Patients sit about two feet away from a light source that emits full-spectrum light, 20 times more powerful than a standard light bulb, indirectly into their eyes. Treatment sessions last around 10 to 15 minutes each day before potentially doubling in length depending on a person's response. Some patients see results within a few days of undergoing therapy. If the above options fail, individuals should seek the help of a health care professional that can recommend extra seasonal depression techniques or prescribe an appropriate antidepressant.